"Voada, you spilled laundry water in the soup pot again!" 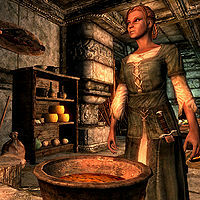 Voada is a Breton citizen who works in the Understone Keep kitchen along with her brother Rondach and bossy master chef Anton Virane. She also handles the dogs that live near the kitchen area. During the Delivery quest, the similar-minded Banning will ask you to bring her some spiced beef for the dogs. She sleeps next to her brother on one of the bedrolls in the kitchen, between midnight and 6am. After waking up she enjoys a one-hour breakfast then starts her workday, which mostly consists of wandering, sweeping, or having debates with Anton Virane. At noon and 6pm she pauses for one-hour meals. Her workday ends at 7pm and she spends the rest of the evening relaxing in the kitchen area. She wears a set of farm clothes and a pair of boots. She is equipped with an iron dagger and carries a selection of lower-class loot and gold. She will occasionally reassure you, "Don't mind the dogs, they get anxious when they haven't had dinner." 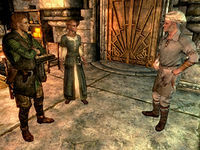 Voada may refer you to Anton, saying, "You should talk to Anton if you need anything. He's the master chef." She will comment on her job, saying, "It's been a hard day cleaning. Good, honest work I say." When you bring her the spiced beef from Banning, she will hand you some gold and say: "Oh, thank you. The dogs were getting restless. Here, this is for you." This page was last modified on 18 October 2018, at 07:12.